Susan Sarandon made a bold statement this week at a movie premiere in France with a creative and colourful tie-dyed outfit. 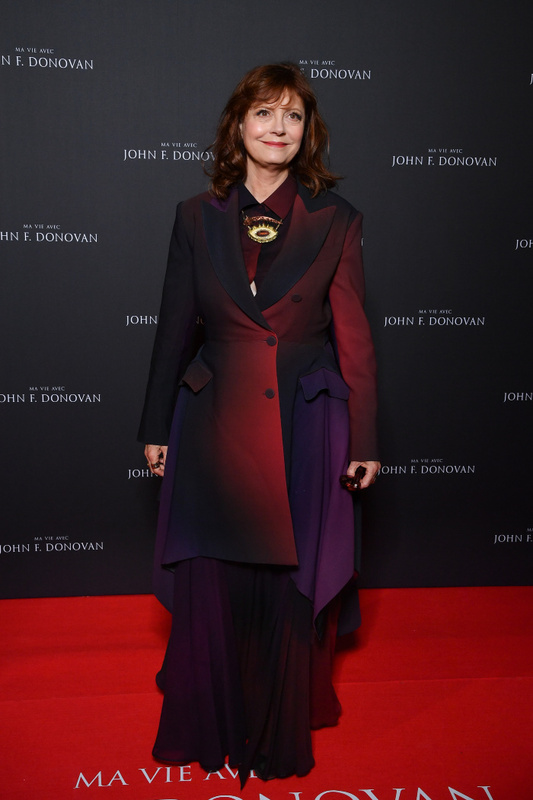 The actress certainly turned heads as she stepped out on the red carpet in a red-and-purple floor-length frock, which she paired with a matching tailored jacket for the special screening of film The Death and Life of John F. Donovan. With her beautiful red locks styled down and in soft waves, the 72-year-old posed for photographers at the MK2 Bibliothèque movie theatre in Paris. Sarandon looked stunning with a touch of blush on her cheeks and dark mascara highlighting her features. Keeping with the bold theme the Thelma and Louise star completed her look with a gold-and-red statement necklace. The much-loved actress joined a string of other stars including Kathy Bates and Natalie Portman, in the beautiful French city to promote her latest movie. The Death and Life of John F. Donovan, which had its world premiere at the 2018 Toronto International Film Festival, follows a range of themes such as celebrity, tabloid media in Hollywood, mother-son relationships and homosexuality. Sarandon hasn’t been seen out and about much of late, last spotted in December in a sophisticated black suit and creative lobster tie in New York City. The actress was all smiles while posing for photos at the Museum of Modern Art for the 50th anniversary screening of the film Belle De Jour hosted by Saint Laurent. Wearing black tailored pants, a black velvet jacket and a black ruffled top, she completed her look with the creative tie. With her hair styled in soft waves and a touch of pink lipstick, Sarandon looked beautiful for the event at the end of the year. The screening was hosted by creative director Anthony Vaccarello and Catherine Deneuve and commemorated the historic link between Belle De Jour and French luxury fashion house Yves Saint Laurent Maison. Are you a fan of Susan Sarandon? What do you think of her outfit choice?